or see the list below. Download an extract (chapts. 1-3) of the book [pdf]. Download the audio samples [zip]. Polak, Rainer (in press) Non-isochronous meter is not irregular. A review of theory and evidence. Proceedings of the Annual Meeting of the Gesellschaft für Musiktheorie 2015, Berlin, edited by Aydintan, Marcus, Florian Edler, Laura Krämer, and Roger Graybill. Hildesheim: Olms. Polak, Rainer (in press) Jembe Music. Continuum Encyclopedia of Popular Music of the World (EPMOW), Part III (Genres), Volume 12. London: Bloomsbury. Polak, R. (2019). Celebration. In J. Sturman (Ed. ), The SAGE International Encyclopedia of Music and Culture (Vol. 2, pp. 476–480). Thousand Oaks, California: Sage Publications. Polak, R., Jacoby, N., Fischinger, T., Goldberg, D., Holzapfel, A., & London, J. (2018). Rhythmic Prototypes Across Cultures: A Comparative Study of Tapping Synchronization. Polak, R., Tarsitani, S., & Clayton, M. (2018). IEMP Malian Jembe. A collection of audiovisual recordings of Malian jembe ensemble performances, with detailed annotations. Open Science Framework (OSF). Neuhoff, Hans, Rainer Polak, and Timo Fischinger (2017) Perception and Evaluation of Timing Patterns in Drum Ensemble Music from Mali. Music Perception 34 (4), 438–451. London, Justin, Rainer Polak, and Nori Jacoby (2017) Rhythm histograms and musical meter: A corpus study of Malian percussion music. Psychonomic Bulletin & Review , 24(2), 474–480. Polak, Rainer (2014) Bala; Bara; Bàtá; Bendre; Bonkolo; Dùndún; Dunun; Jembe; Sabar; Tama. New Grove Dictionary of Musical Instruments, 2nd ed. Oxford: Oxford University Press. Polak, Rainer (1998) Jenbe Music in Bamako: Microtiming as Formal Model and Performance Practice. Iwalewa-Forum 2, 24–46. Polak, Rainer (2008) The Jenbe Realbook, Vol 2. Nürnberg: Bibiafrica. Polak, Rainer (2006) The Jenbe Realbook, Vol 1. Nürnberg: Bibiafrica. 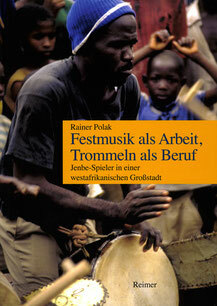 Polak, Rainer (1999) Andreas Meyer: Afrikanische Trommeln. The World of Music 41/1. Polak, Rainer (1999) Gilbert Rouget: Guinée. Musique Malinké. The World of Music 41/2. Polak, Rainer (1999) Thomas Hale: Griots and Griottes. The World of Music 41/3.